I have been spending some time in my garden these days enjoying the daffodils and digging in the dirt! This is one of my favorite times of the year as everything here in Michigan begins to turn green, and yellow and pink and lavender, and ... you get the idea. I just love to watch things grow in my garden. The deer have eaten lots more tops of things than usual. I'm not sure if my tulips will survive their trimmings, but the deer don't like the daffodils, so they are cheerily popping up everywhere. This flower bed runs across the front of our property along the road. Every year I put in more bulbs, whether they are on sale, given to me as gifts, or traded for other things. Each year the color gets "bigger". We are also salvaging materials for a "new" potting shed. We now have several old wood windows, some cement block and a few other items. As we enlarge the collection of salvaged building materials we will design and build the shed. My husband humors me and we enjoy the process together. I hope we can start the building sometime this summer. 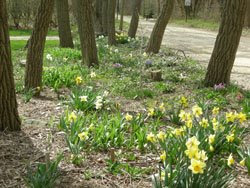 Right now I am thrilled that my daffodils and hyacinths are blooming and that the weather has been very nice.